This is my version of the Examine windows. This xml file contains all the Examine windows in it. And is a direct replacement for the default eq2ui_examine.xml file. When any one of the types of examine windows open, the control to close is hidden. Simply hover the mouse on the examine window and the CLOSE button displays. Take mouse off, and the close button goes away. I also tried to rid as much "dead" space as possible. Some of it, is just not able to be gotten rid of. 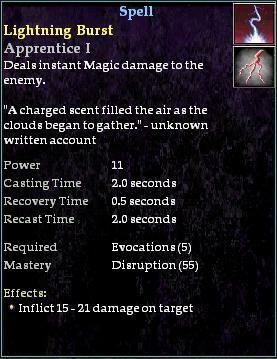 For instance the bit of space at the bottom of the spell, item and recipe windows. Credit to anyone who I might have used bits of their stuff in my window just forgetting what I might have used. Place the player_bg1.dds into your /mods/images dirtectory. Comments and suggestions always welcomed!! All I did was change the colors and background image to match the Fetish Nightfall UI. All code credit here goes to depechenode and Fetish. NOTE: There is no player_bg1.dds file with this download, as it has been modified to use fetish_background.dds from Fetish Nightfall. 3.0 - Includes changes from April 6, 2005 "Big Patch"